On The Block: Is The Phnom Penh Post Going... Going... 金边邮报? According to previously reliable Twitter user ‘Violet Baudelaire’ (@ioBaudelaire), who claims to be a Post employee, the almost 26-year old publication has been sold to Chinese owned Prince Real Estate Group, one of Cambodia’s largest property developers. The official announcement is to be made on Tuesday next week (July 17), ‘Ms Baudelaire’ tweeted. If true the sale will likely herald the end for the English-language version of The Phnom Penh Post. 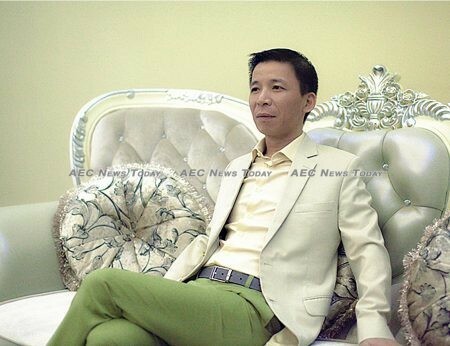 People familiar with Prince Real Estate Group told AEC News Today its efforts are “entirely focused on the Chinese market”, while recent reports say the print run for both language editions of the Post have dropped to a mere 2,000 copies in total, with printing staff said to be only working between three and five hours a day. When AEC News Today phoned Prince Real Estate in Phnom Penh earlier this week we were told “my company [managers] only speak Chinese”. Unsurprisingly, messages left regarding the company’s intended purchase of the Post were not returned. 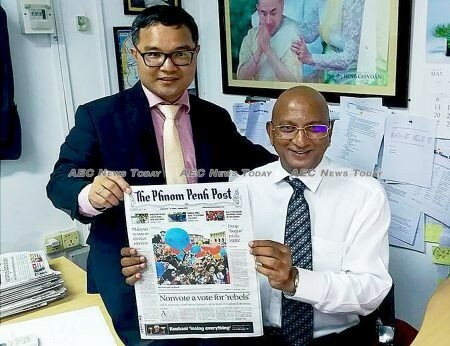 Speculation has been rife that the Post was about to go through another upheaval when it was noted that legal counsel Ly Tayseng had assumed the mantle of CEO and publisher in the publications mastheads. This only increased when it was found that Cambodia Ministry of Commerce (MoC) records showed Mr Ganapathy ceased being a director of Post Media on July 2. Responding to eMail inquiries Mr Ganapathy only added fuel to the speculation. 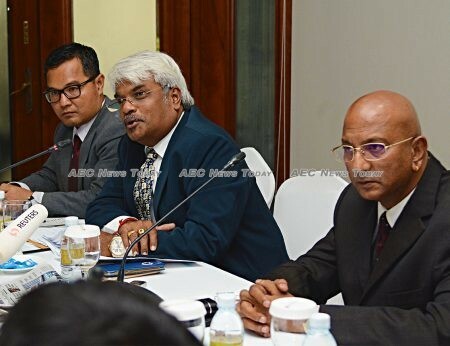 Referring to his media conference in Phnom Penh on May 18 Mr Ganapathy said “l did clearly state that there would be a rationalisation and restructuring which would be easy to comprehend given the path we are taking (See: Heated Exchanges as New Phnom Penh Post Boss Meets the Press). “Over and above that, in assuring that l would maintain the legacy, hasn’t The Phnom Penh Post been very fair and liberal in its coverage since Day one of the takeover? “So lets be fair and let the paper evolve, as any business would under a new owner. Enough said, I figure. Let matters take its (sic) course”, he added. 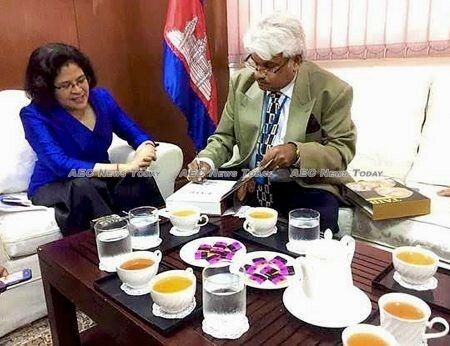 A media release issued by Mr Ganapathy’s public relations firm Asia PR on a courtesy call by him with Rath Many, Cambodia Ambassador to Malaysia on July 9 only served to increase speculation that the once highly regarded English-language daily and its Khmer-language sibling were again up for sale. Just prior to Post Media being sold last May an email allegedly sent by former Post CEO Chris Dawe to a Post Media staffer containing unsubstantiated claims and alleged admissions in relation to an unfair dismissal and breach of contract claim against the publisher was conveniently leaked to the Australian ABC (See: Phnom Penh Post Sale Distraction? : Australian ABC Victim Blaming Attack On Cue), deflecting attention away from the sale taking place at the time. 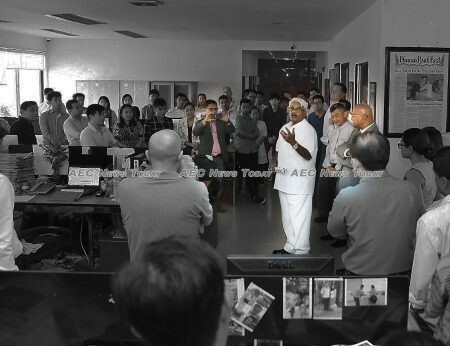 The timing of Mr Ganapathy’s visit and media release also appears designed to focus attention away from events in Phnom Penh, or at the least cause confusion as to what his role with the company now is. The somewhat self-serving media release cited Ms Rath as saying ‘that it was a big relief that the Post was not shut down as that could have put 160-odd employees out of a job. The media in Cambodia are still free to report on matters so long as their reporting is fair and balanced’, she was cited as saying. The presser then went on to say ‘Ms Many agreed with Siva that Phnom Penh had become a roosting ground for rogue journalists who had, over the years been only writing only(sic) what they wanted to write, which was more often than not a departure from the facts and the truth of the matters raised. ‘She welcome (sic) Siva’s initiative and looked forward to a newspaper which Siva assured would continue the legacy of truthful, fair and balanced journalism as what has been demonstrated in an independent Phnom Penh Post‘, the release stated. How Mr Ganapathy will explain its sale, if the current claim is true the next time the pair meet is unknown. Mr Ganapathy did not respond to emailed questions asking why the media release dated July 9 described him as the ‘publisher’ and in control of Post Media seven days after he had ceased to be a director. Similarly Mr Ganapathy said he would “not respond to rumours” that he had been removed from the CEOs role by the ‘real owners’. Rumours rumbling around Phnom Penh claim Post Media was really bought by Malaysian infrastructure, development, and telecommunications company MRails Group. According to people with knowledge of the situation Mr Ganapathy was a proxy for the group, which wanted to keep its ownership secret. 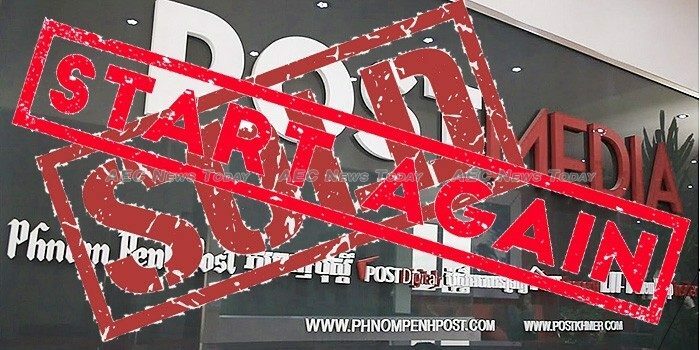 According to a number of people the intention had been to run both language editions of the Post as going commercial concerns and to quietly leverage their profile in the kingdom. Although currently four pages less than the 20 page editions prior to the sale, advertisers appear to have returned, while the editorial line has been sufficiently far from the cowed or toothless publication many had forecast to adequately put to rest notions that the sale of the Post had been driven by aims to silence its harsh criticism of the government. The owners reportedly now feel, however, that the debacle following the take-over announcement have combined to make the Post too ‘tainted’ and bereft of talent to continue its past proud traditions. The matters which are believed to have particularly irked the real owners include a highly speculative and fact-challenged uncomplimentary article written about the new ‘owner’, Mr Ganapthy; the resignation of almost all Western journalists and senior editorial staff; and the accidental release of a photo as part of the media briefing kit which AEC News Today showed identified the buyer as ‘Media More’ and not Mr Ganapathy. MRails did not respond to inquiries asking if they were the real owners of Post Media; whether it was selling its shareholding in Post Media; or whether it had negotiated any continuity of employment for staff with the new owners. Who is Prince Real Estate Group? With Prince Real Estate Group’s business model firmly focused on the Chinese market speculation is rife that the English-language edition of The Phnom Penh Post will be rapidly morphed into a Chinese-language real estate publication. Whether the English-language name will be retained is not known, but considered unlikely. “The Khmer-language edition is likely to survive due to the large number of property developments aimed at the Khmer market in progress, but Prince’s business is all Chinese”, a person with knowledge of the Cambodian real estate sector who spoke on condition of anonymity said. Established in 2015 and headed by ‘Chinese business tycoon’ Qiu Guoxing, the commercial and residential property developer now comprises 13 divisions with investments in the real estate, communications, and finance sectors. In addition to being executive vice chairman of Kampuchea Prince Real Estate Investment Group Co., Mr Qiu is also chairman of the Kampuchea Real Estate Charitable Foundation, executive vice president of the Fujian Kampuchea Chamber of Commerce, and chairman of the Kampuchea Real Estate Development Association. Among the projects the company is currently developing in Phnom Penh are Prince Modern Plaza, Prince Club Project, Prince Time Hotel, Prince Cullinan Bay, Diamond One, Prince International Plaza, and Prince City Centre and Koh Takev in Sihanoukville. Last year the company announced plans for an as yet unnamed development costing up to US$300 million on Norodom Boulevard, one of Phnom Penh’s major roads. In May the company reportedly donated $500,000 to Cambodia Red Cross, which is headed by Bun Rany, wife of Cambodia Prime Minister Hun Sen.
Mr Tayseng did not respond to emails earlier in the week asking him if Post Media was being sold, while Mr Purushotman did not respond to inquiries asking if their was any validity to the tweets claiming Post Media was in the process of, or had already been purchased by Prince Real Estate Group.